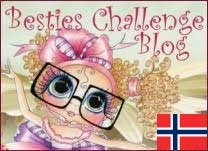 Hi, there, i hope i can help you out with our challenges at My Besties International. We have a set date for our challenges, the Shabby Chic one started on Nov. 10. To be eligible for the prize your projects must be posted on that date or after. Another thing, so that you will get comments is to link your card post address to the challenge blog, if you link to your blog we have to guess which card you've entered and scroll to find it. All challenges that you would enter would require you to link back in your post to the challenge. I hope this information helps, i would like to see you have a chance to win. Your project is so lovely!